Methoxyflurane, marketed as Penthrox among others, is an inhaled medication primarily used to improve pain following trauma. It may also be used for short episodes of pain as a result of medical procedures. Onset of pain relief is rapid and of a short duration. Use is only recommended with direct medical supervision. Cyclobenzaprine, sold under the brand name Flexeril among others, is a medication used for muscle spasms from musculoskeletal conditions of sudden onset. It is not useful in cerebral palsy. It is taken by mouth. Use is not recommended for more than a few weeks. Sulindac is a nonsteroidal anti-inflammatory drug (NSAID) of the arylalkanoic acid class that is marketed as Clinoril. Imbaral (not to be confused with mebaral) is another name for this drug. Gabapentin, sold under the brand name Neurontin among others, is an anticonvulsant medication used to treat partial seizures, neuropathic pain, hot flashes, and restless legs syndrome. It is recommended as one of a number of first-line medications for the treatment of neuropathic pain caused by diabetic neuropathy, postherpetic neuralgia, and central neuropathic pain. About 15% of those given gabapentin for diabetic neuropathy or postherpetic neuralgia have a measurable benefit. Gabapentin is taken by mouth. Butorphanol is a morphinan-type synthetic agonist–antagonist opioid analgesic developed by Bristol-Myers. Butorphanol is most closely structurally related to levorphanol. Butorphanol is available as the tartrate salt in injectable, tablet, and intranasal spray formulations. The tablet form is only used in dogs and cats due to low bioavailability in humans. Clonidine, sold as the brand name Catapres among others, is a medication used to treat high blood pressure, attention deficit hyperactivity disorder, drug withdrawal (alcohol, opioids, or smoking), menopausal flushing, diarrhea, and certain pain conditions. It is used by mouth, by injection, or as a skin patch. Onset of action is typically within an hour with the effects on blood pressure lasting for up to eight hours. Ketoprofen is one of the propionic acid class of nonsteroidal anti-inflammatory drugs (NSAID) with analgesic and antipyretic effects. It acts by inhibiting the body’s production of prostaglandin. It was patented in 1967 and approved for medical use in 1980. Benzylmorphine (Peronine) is a semi-synthetic opioid narcotic introduced to the international market in 1896 and that of the United States very shortly thereafter. It is much like codeine, containing a benzyl group attached to the morphine molecule just as the methyl group creates codeine and the ethyl group creates ethylmorphine or dionine (used as a generic name for that drug just as peronine is for benzylmorphine). It is about 90% as strong as codeine by weight. Gabapentin enacarbil (Horizant (IR) (U.S.), Regnite (in Japan)) is an anticonvulsant and analgesic drug of the gabapentinoid class, and a prodrug to gabapentin. It was designed for increased oral bioavailability over gabapentin, and human trials showed it to produce extended release of gabapentin with almost twice the overall bioavailability, especially when taken with a fatty meal. Gabapentin enacarbil has passed human clinical trials for the treatment of restless legs syndrome, and initial results have shown it to be well tolerated and reasonably effective. Indometacin, also known as indomethacin, is a nonsteroidal anti-inflammatory drug (NSAID) commonly used as a prescription medication to reduce fever, pain, stiffness, and swelling from inflammation. It works by inhibiting the production of prostaglandins, endogenous signaling molecules known to cause these symptoms. It does this by inhibiting cyclooxygenase, an enzyme that catalyzes the production of prostaglandins. Hydromorphone, also known as dihydromorphinone, and sold under the brand name Dilaudid, among others, is a centrally acting pain medication of the opioid class. It is made from morphine. Comparatively, hydromorphone is to morphine as hydrocodone is to codeine – it is a hydrogenated ketone thereof. In medical terms, it is an opioid analgesic, while in legal terms, a narcotic. Hydromorphone is commonly used in the hospital setting, mostly by injection into a vein because its bioavailability is very low orally, rectally, and intranasally. Administration under the tongue is usually superior to swallowing for bioavailability and effects; however, hydromorphone is bitter and hydrophilic, so it is absorbed poorly and slowly through mouth membranes. Nicocodeine (Lyopect, Tusscodin) is an opioid analgesic and cough suppressant, an ester of codeine closely related to dihydrocodeine and the codeine analogue of nicomorphine. 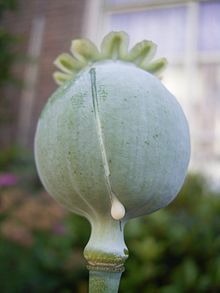 It is not commonly used in most countries, but has activity similar to other opiates. Nicocodeine and nicomorphine were introduced in 1957 by Lannacher Heilmittel of Austria. Nicocodeine is metabolised in the liver by demethylation to produce nicomorphine, also known as 6-nicotinoylmorphine, and subsequently further metabolised to morphine. Side effects are similar to those of other opiates and include itching, nausea and respiratory depression. Related opioid analogues such as nicomorphine and nicodicodeine were first synthesized. The definitive synthesis, which involves treating anhydrous codeine base with nicotinic anhydride at 130 °C, was published by Pongratz and Zirm in Monatshefte für Chemie in 1957, simultaneously with the two analogues in an article about amides and esters of various organic acids. Mefenamic acid is a member of the anthranilic acid derivatives (or fenamate) class of NSAID drugs, and is used to treat mild to moderate pain, including menstrual pain, and is sometimes used to prevent migraines associated with menstruation. It is not widely used in the United States due to its side effects and high cost compared to other NSAID drugs. Nefopam, sold under the brand names Acupan and nefopam medisol among others, is a painkilling medication. It is primarily used to treat moderate to severe, acute or chronic pain. Codeine is an opiate used to treat pain, as a cough medicine, and for diarrhea. It is typically used to treat mild to moderate degrees of pain. Greater benefit may occur when combined with paracetamol (acetaminophen) or a nonsteroidal anti-inflammatory drug (NSAID) such as aspirin or ibuprofen. Evidence does not support its use for acute cough suppression in children or adults. In Europe it is not recommended as a cough medicine in those under twelve years of age. It is generally taken by mouth. It typically starts working after half an hour with maximum effect at two hours. Its effects last for about four to six hours. Do you have a question about Analgesics that you can’t find the answer to?